On the 3rd of July, a team of 15 Alumni from Sri Sathya Sai Institutions visited the beautiful Mandya Campus and School named Sri Sathya Sai Sharadaniketan. The place is a historical place with amazing folklore and interesting background to it.How the particular location of Maradevanahalli came to be the site of this divine project has its own story to tell. How the place had been preserved to play out its destiny, with stories of haunted ghosts keeping people away for over two centuries! It seemed like the so-called ghosts were playing their own part in guarding this land for the Lord to take-over. Also, while the lands surrounding the site are fertile and with surplus water and rich plantations, the designated site area itself was barren with no water source and with a reputation of being haunted. Added to all this was the belief that the land brought calamity to anyone who brought it, ensured the land was left untouched! The incredible story of the Grama devata (village deity) whose neglect ha brought ruin to the region had been appeased by constructing a beautiful temple for her, even before any work on the school began. Then the legend of the Yogi who, 200 years back, had picked this place of Tapas, and who continues to stay and meditate underneath in a tunnel even after his death. How he fiercely has been guarding this place, even as he asked the team who came to build this school, to not to destroy his cave. Today one can see his idol in one of two magnificent new temples that have been constructed on the campus. His wish was to have his idol be placed in front of the Shiva temple and this was fulfilled by the Lord. Swami has said that these temples would become places of pilgrimage in future. 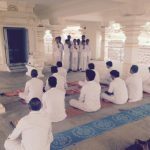 While at the temple, the visiting group of around 15 alumni mostly from the Prasanthi Nilayam and Brindavan campuses, also inaugurated the first ‘Alumni Cell’. As per Swami’s command each campus will have an alumni cell which will coordinate the alumni communications and engagements for the alumni of the campus and thus establishing a platform for the alumni to stay connected with their alma mater. The team which will drive this key initiative at the campus will include Sri Vinaybhushan (who is also the warden in the campus) and Sri Yogeesh (who is the deputy warden at the campus). Both these dedicated individuals also have a good connect with the two batches of students who have passed out of the portals of this institution. Incidentally, for most among the visiting team this was their first visit to one of Swami’s new campuses, which have come up in the past 3 years. We then got to see the beautiful school edifice with a prayer hall at the center which also has a sizeable room for Prema Sai along with interview rooms. The interaction with the young children was something amazing as many among the visiting team would vouch for. These kids are all mostly from rural areas and many of them struggle to even read when they join the school. It was quite fascinating to hear about the hard work that the teachers have to put in, with patience and love, to bring them up at par. We had the good fortune of listening to a 6th class child who had just joined the school and spoke so eloquently about how he is blessed to be part of this school and aspires to be part of Swami’s Mission by becoming a teacher or a doctor. The children have never seen Swami’s physical form but the intensity of love that they have for Swami is just astonishing. During Swami’s previous week visit to the campus, one child went to Swami and asked – “Swami, I don’t have my Mother. You become my Mother and Father” and Swami Lovingly replied – “Yes. I am your Mother and Father. I will take care of you”. They all, already have got such a beautiful relationship with Swami. When Swami, during His recent visit to the campus, visited their rooms, they had meticulously cleaned their rooms, spread their blankets as ‘path’ for swami to walk on and made improvised thrones for Swami in each room, using bedding rolls, buckets and bed-sheets!!. The children were so thrilled that the Lord had come to their rooms and had spoken to them. Truly, the bond between Swami and his students is something inexplicable. The enthusiasm, the energy levels and the love of these kids for Swami is undoubtedly reminiscent of our schools and colleges in Puttaparthi, Brindavan and Anantapur. While we conducted some wonderful programs for the kids, led by some of our talented team members, which the children thoroughly enjoyed, we were still left with the impression that it is we who were the biggest beneficiaries of this visit, touched by their enthusiasm and love. We were spellbound seeing the children answering questions on Ramayana and Incidents from Swamis Life, while we conducted a short quiz to engage them. Over next few years, we were told of the grand plans Swami has for this place including a hospital. Brother Sai Prasad an senior alumnus of Muddenahalli campus who had taken the time to come down to the campus to meet us walked the group through his own journey along with two other senior alumni based in Mandya brothers Dr. Premamnand and Dr. Umesh from day one of the project, the challenges they had faced and how Swami had held their hand and guided them all along which had been a transformative experience for them all. Brother Sai Prasad’s passion and level of commitment was quite evident from his tone and it was quite inspiring to know of our alumni and their amazing role in the campus. The hard work of these stalwarts and the teachers who come to support the children is really commendable. We saw Swami’s signature deeply imprinted in the way of working, living life style and environment and many more aspects that touched all of us who were present there. Swami has reiterated several times how we need to see these kids as our own brothers and take upon ourselves the task of helping, in their education and sharing the rich set of experiences that Swami has given us all. It was truly a great experience for all of us who visited the campus and we had many take-away’s for our own personal and community sadhana.